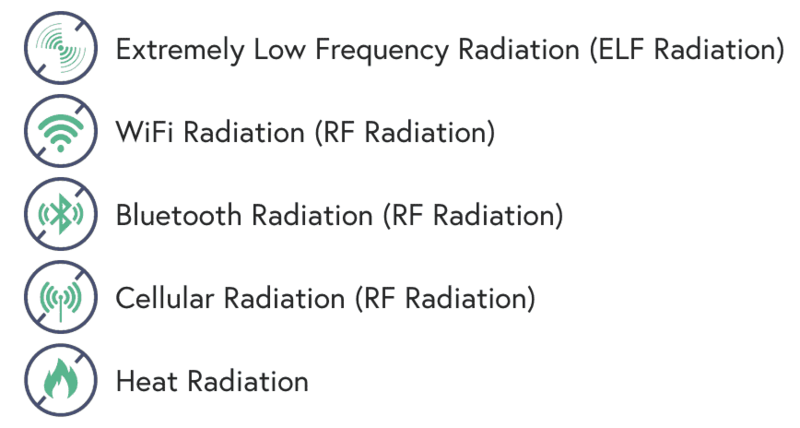 Most people that are aware of the dangers of EMF radiation are mostly concerned with things like cell-phones, smart meters, microwaves, WiFi, etc. It is right to be concerned about these things, but something that is often overlooked is the large amount of EMF radiation that iPads and other tablets emit. Luckily, there are some fantastic products on the market to help combat this radiation source. 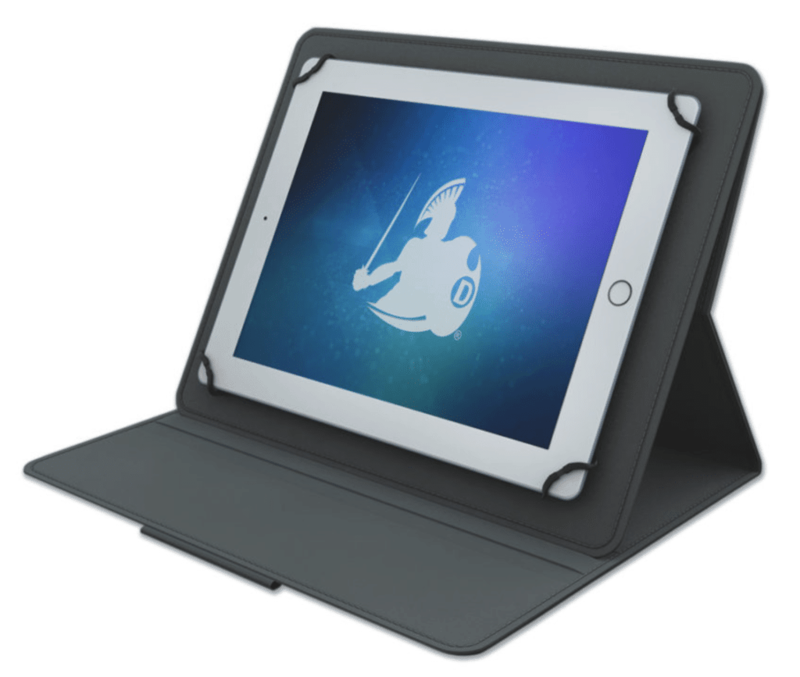 In this guide we’ll talk about the absolute best iPad and tablet radiation shields on the market, and why you probably need one. After my reviews of the best products, I’ll dive a bit deeper into what kind of radiation tablets emit, why it’s dangerous, and simple ways you can reduce your exposure. I have personally used, tested, and researched all of the products on this list and these are my honest opinions. Get the iPad case here. Get other Tablet cases here. I’ve been a huge fan of Defendershield products for a while, so I wasn’t surprised to find that they also made the best tablet case on the market (they also sell my favorite Air Tube headphones. I have this case and tested it with an Amazon Kindle Fire. First of all, I found the quality of the case to be really high. The outer part has a really nice feel to it, and the inside is soft and protective. The tablet stays inside with 4 rubber clips for the corners. These held the tablet in extremely well and I never had it fall out in all the time I used the case. I found the design to be extremely intuitive and nice to use. I’ve used many EMF protection tablet cases, and just normal tablet cases, and found this one just so nice to use. You can use it on your lap, or put it up in the tri-fold as you see in the image. I also really loved that it has a swivel mechanism so that you can spin the tablet in the case to portrait or landscape and still have it work really well, I was surprised how often I used this. Check out this video to get a better idea of how this case works, then we’ll talk about it’s EMF protection capabilities. In my own testing, I found that the Defender shield blocked all three types of EMF radiation at extremely high levels. Unlike many cell-phone cases, their tablet case blocks radiation on both sides of the tablet. So whether it’s flat on your lap or tri-folded on a table, it will be blocking EMF radiation both on the bottom of the case and on the back. I also really appreciate that Defendershield has all of their shielding effectiveness testing results published right on their website. Overall this is just my favorite tablet radiation shield on the market, and I’d encourage you to try it out. The company has great customer service and a fantastic return policy in case for some reason you don’t love it as much as I do. If you’re interested in checking out the many other products that Defendershield carries, you can check out my full review here. Checkout Safesleeve’s line of tablet cases here. Safesleeve is another huge company in the EMF protection space, and they have an extensive line of products. I have been a fan of my of their products for a while, and their tablet case is no exception. Really, only Defendershield and Safesleeve make a quality anti-radiation tablet case. Harapad makes one, which I’ll talk about in a minute, but it has some drawbacks. Overall this case from Safesleeve is very similar in design to the Defendershield case, with the primary differences being the closure mechanism (elastic band compared to magnetic clasp), and the materials used for the case. 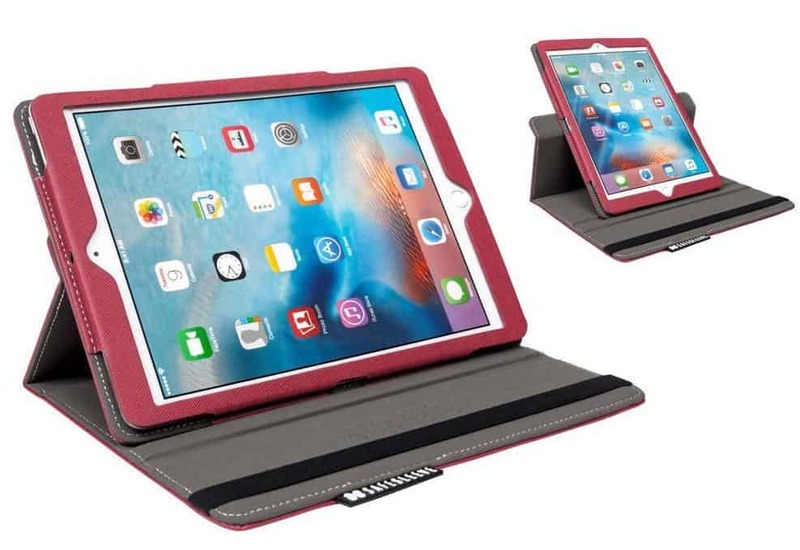 The Safesleeve case also has a nice swivel mechanism that you can see in the image to the right, that allows you to easily adjust your tablet between portrait and landscape mode while it’s in the tri-fold position. I particularly love the iPad case. The nice thing about this case (you can see this in the video below) is that the iPad slips into a nice sleeve with a hidden velcro closure. This keeps the iPad firmly in position while also looking really nice. The universal case works much like the Defendershield, with rubber wrapped metal corners that hold the tablet in place. Check out this video from Safesleeve to get a better idea for the look and design of their EMF protection tablet case. 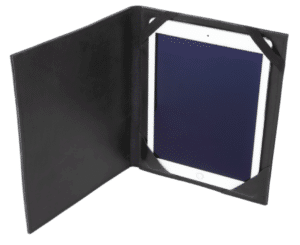 The Safesleeve tablet case is also made with state of the art EMF blocking materials built right into the case. As you can see from the image below, there is a lead-free anti-radiation material wedged inside the case itself. This, along with a soft micro-fiber line and high-impact insert makes it not only a good EMF protection case but also a great case for protecting your device. Safesleeve published the results of their independent lab testings on their website that you can check out for yourself. Just like any good company, Safesleeve also has a really great 30-day return policy. So if for any reason you don’t absolutely love the case and feel like you’re getting great protection from it, you can return it and get your full money back. Harapad makes some great products, but I’m not personally a huge fan of this specific one, and I’ll tell you why in a second. First, let’s talk about a few of the things I do like about this case. I like the leather, it feels nice in the hand and gives it a high-end touch. I believe the EMF protection capabilities of the case because HARApad makes some great products. I also like that the case is very lightweight and sleek. It is significantly less bulky than either the Defendershield or the Safesleeve cases I talked about above. Alright, now to a few of the things I don’t love about the Harapad tablet case. First of all, it lacks functionality. It is essentially just a simple sleeve that opens and closes. It doesn’t have the normal tri-folding mechanics you expect from an iPad case, and instead opens and closes more like a book cover. I also don’t like the universal insert design. The bottom corners of your iPad or tablet slide into little corner pockets and the top corners are held in by elastic. After enough time I found that those elastic bands stretched out, and my tablet would easily fall out of the case if I wasn’t careful. Even before they stretch out, you have to be careful to not swing the case around too much or it could fly out. I also think the price is a bit high, at least compared to the other cases mentioned in this list. I’m guessing that the high-price is mainly due to the real leather used in the case. So overall, if you’re looking for a thin, classy looking anti-radiation tablet case, and the price doesn’t matter to you much, this is probably the case for you. Otherwise, I would get one of the other cases mentioned above. Alright, now that we’ve talked about the three best iPad and tablet EMF protection cases, let’s talk a little bit about why I think you need one. iPad and Tablet Radiation – Should You Be Worried? Both of those articles are packed full of information, so I’d encourage you to take a look. However in case you don’t have time for that, let’s talk about some of the more important points. Obviously, this will vary a little bit depending on the tablet we’re talking about. 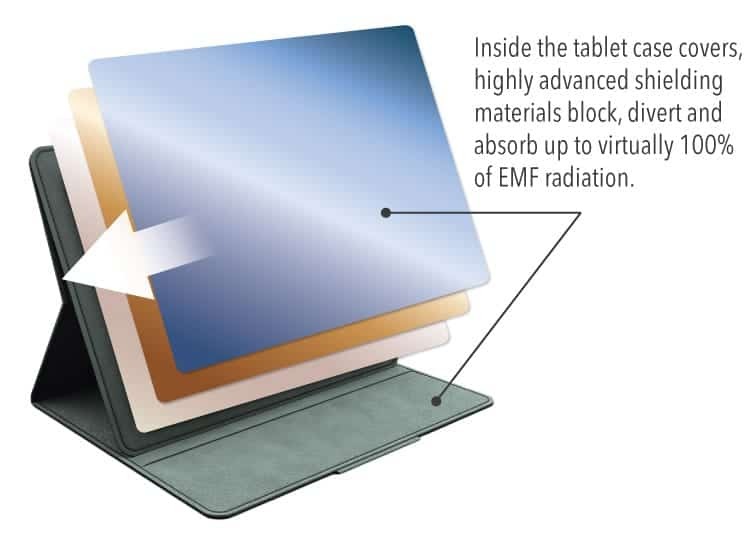 However, most tablets today, like the iPad, function much like laptops and therefore emit large amounts of EMF radiation. These tablets emit Radio Frequency radiation as they stay connected and transfer data via WiFi and cellular tower connection. Whenever you are browsing the web, messaging someone, facetime, or even using most apps, your tablet is transferring and receiving data, resulting in RF radiation being emitted from the device. Even when you aren’t using the device, just like your cell phone, it still emits some radiation. Although you might not see it, your device is still receiving updates, maintaining a connection, transferring and receiving data etc. The logic board and circuitry inside also will emit fairly high levels of both electric field and magnetic field radiation, both of which are measurable with any good EMF meter. Consistent exposure to EMF radiation, sometimes called EMR, has constantly shown to cause all kinds of symptoms and health issues. Microwave radiation absorbed from tablet computers (Wi-Fi) positioned close to the body can be similar to that from mobile phones as they have similar maximum specific absorption rate (SAR) values. Average maximum SAR for a sample of 358 digital mobile phones is 1.02 W/Kg in 1g tissue (sarvalues.com; adult); iPad maximum SAR on Wi-Fi is 1.19 W/Kg in 1g tissue (iPad Information Guide; adult). Thus, wireless computers positioned close to the body could expose the users to similar levels of radiation as mobile phones. Alright, now let’s talk a little bit about some of the best ways you can go about protecting yourself from Tablet radiation. This sounds simple, but it’s actually really important. It has been proven that the dangers of EMF radiation are cumulative, meaning the more exposure over a lifetime, the more dangerous it is. Doing simple things like eliminating obvious sources of radiation, and reducing your use of electronics can go a long way to improving your health. If you have an iPad, iOS 12 has a feature now that shows how much you use the device, as well as specific apps. This can give you a ton of insight into just how much you use the device. This is really important for your phone as well, which is why I included it in my guide to reducing iPhone radiation. Putting your phone, iPad, Kindle, or any other tablet into Airplane mode, whenever you don’t need the WiFi, will reduce the Radio Frequency radiation to almost nothing. So whenever you don’t need internet connectivity, such as reading a document, playing a game, writing a note, or anything else, just put your device into airplane mode. This one should be pretty obvious, but the amount these cases actually protect you is pretty remarkable. I would opt for the Defendershield case but the Safesleeve case is a solid option as well. Get an EMF Meter! This is important for anyone that cares about safety from EMF radiation. With a quality EMF meter, you can read the ambient radiation level in your home, as well as determining how much radiation is being emitted by various devices. This is also important when you’re looking to make changes because you can actually determine if they’re working. I personally have and love the new TriField TF2 (read my review) as it’s simple to use, lasts forever, is extremely accurate, and measures all three types of EMF radiation. If you’re looking for a low-cost EMF meter I really like the Meterk (read my review). Tablets are so insanely convenient and are becoming more and more popular. I truly think that an anti-radiation case for your iPad or other tablets can go a really long way at protecting your body from EMF radiation. I hope you found this guide helpful, if you did, please consider sharing it!